Pockets with reinforced fourfold DIN punching are suitable for storage of smaller, flat objects such as photographs, letters, notes etc. They are made of unbuffered, transparent or opaque archival paper. 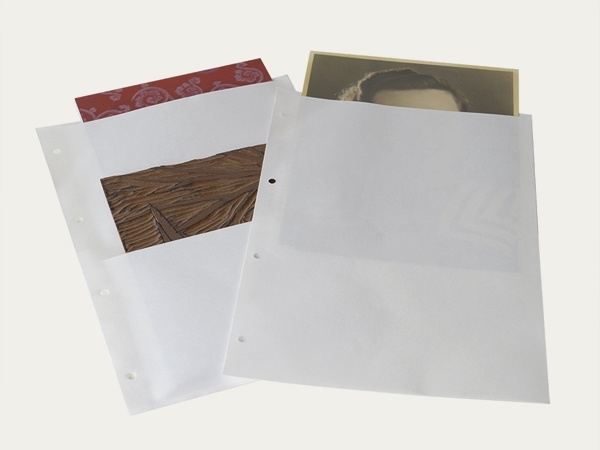 Binder pocket pages made from transparent archival paper without an alkaline buffer, with reinforced, standard punched 4-hole binder-edges. Available for 35 mm and 6 x 6 cm negative strips (pocket opening on the side), for A4/A6 sizes and 18 x 24, 13 x 18, 10 x 15, 9 x 13 and 9 x 12 cm sizes( pocket opening on the top). Binder pocket pages made from opaque archival paper without an alkaline buffer, with reinforced, standard punched 4-hole binder-edges. Available for A5/A6 sizes and for standard photo sizes (pocket opening on the top). Other sizes on request. Both, paper and glue have passed the Photographic Activity Test (PAT) in accordance with ISO 18916.